PCA Skin Detoxifying Mask Review (2018): Is It Safe To Use? What Is PCA SKIN Detoxifying Mask? 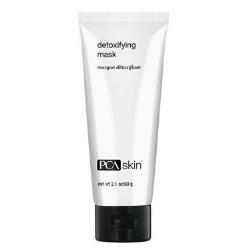 PCA SKIN Detoxifying Mask, US $58 for 2.1 oz. tube, is a treatment formulation that clears your pores and smoothens your skin surface. As a beauty brand that believes in the power of chemical peeling to facilitate efficient skin renewal and rejuvenation, PCA Skin has been formulating and distributing products that contain acids to improve skin health and appearance. Founded in 1990, the company has been formulating products that are designed and formulated with the needs of specific skin types that have clear aims. Its robust line of products includes moisturizers, toners and sunscreens. PCA SKIN Detoxifying Mask – Does It Really Work? This product works by delivering clay masks that readily and easily absorbs excess oils from your skin, riffing your skin of impurities, as skin conditioning ingredients help relieve your skin of dryness and inflammations. With regular use, your skin becomes clearer, brighter and more refined. What Are The Ingredients In PCA SKIN Detoxifying Mask? Japanese White Charcoal: absorbs toxins, oils and impurities from your skin, ridding it of foreign bodies as well as excess oils that can trigger the formation of blemishes and cause skin to become infected by bacteria. Kaolin: a natural clay that absorbs your skin’s excess oils and leaves your complexion with a mattified finish. Magnesium Aluminum Silicate: like kaolin, this clay mineral also absorbs excess oils from your skin to clarify and purify your skin. Glycerin: a powerful emollient and humectant, this ingredient significantly increases your skin’s moisture content, but also can cause skin irritation to sensitive skin. This product contains natural clays with well-recognized abilities for absorbing and mattifying oily skin. The formula includes anti-inflammatory ingredients that help even out your skin tone. The formula, although anti-grease, does not leave your skin leave out and dry. Although Many user reviews say it isn’t very effective. The manufacturer did not provide any proof of product efficacy, whether that be consumer testing or, clinical trial. This product misses out on other ingredients that may have to be compensated by other products in your regimen. PCA SKIN Detoxifying Mask reviews are practically unavailable, making it impossible to gauge how other people are finding this product given their unique skin conditions and circumstances. Does PCA SKIN Detoxifying Mask Have Any Side Effects? PCA SKIN Detoxifying Mask must only be used once weekly to avoid over drying your skin. This treatment is best suited for people who have combination to oily skin types. Apply product on dry or damp skin on your face, neck and chest. Leave on for about 15 to 20 minutes or, until product dries out. Rinse off with lukewarm water — if preferred, with washcloth. Follow through immediately with your favorite moisturizer. PCA SKIN Detoxifying Mask seems fairly formulated to deliver what it claims to be able to deliver. There is also a relatively less presence of toxic ingredients in the formula that can hurt your skin and your overall health. However, in the absence of authentic user reviews and clinical trials, it is difficult to gauge how this product actually performs unless you actually get hold of it and try it. If you need more information therefore, you may have to look at other products that have been tried and tested for some time.